As a leader, your job is to design and build a powerful company culture that attracts both employees that believe in the work and the customers who align with your message and ideals. But, how do you maintain the culture and philosophy that inspired an organization as it grows? Businesses are usually started by people with a passion for a cause or an ability to provide value where they see opportunities. As a company starts to grow and add people to the mix that original culture and purpose can quickly become diluted. A vision-driven culture, for example, can easily become a task-driven culture with a few wrong hires. High-growth organizations need to have a disciplined process in place to make sure that the correct culture evolves and grows along with the people. This can be hard for many executives to talk about. Culture is a ‘fluffy’ word — it can mean lots of things to lots of people. While all other aspects of the business are very much driven by what’s measured and trackable. The funny thing is, you inherently know what their culture is when you observe a company, but it’s not exactly something you can track on an Excel spreadsheet. So where do you start? We suggest beginning with this basic assumption: culture is a key part of any winning strategy. Peter Drucker is famously quoted for saying ‘culture eats strategy for breakfast,’ and it’s largely true. If your strategy is perfect but everyone is chasing their own silo priorities and undercutting each other, that perfect strategy is like a tree falling in the forest. Ultimately, it means nothing — because the culture wasn’t there to execute it. What code of behavior governs our work? Do we have cultural/ethical beliefs that guide us? At TeamWorks, we’re often helping clients navigate these conversations during their strategic planning discussions. They’re always interesting to observe. Sometimes, companies in high-growth stages have spent so much time on task work and financials that these questions seem very far away for them. Clarifying your company culture in the beginning will make everything that comes next much easier to achieve. Once your senior leaders have answered the questions above and you’ve outlined the culture you want to create it needs to be ratified and shared. Then, you need a feedback loop. What do middle managers think? What do your front-line employees think? Compile the feedback and adjust the outline of the culture accordingly. Now, this isn’t just a document you create that sits on a shelf or hangs on the walls in the boardroom. It has to be a living, breathing code of behavior. Patty McCord created the Netflix culture deck, which Sheryl Sandberg once called “the most important document ever to come out of Silicon Valley.” What makes the Netflix culture deck stand out so much? It’s treated as a living, breathing document — not a list of adjectives that executives repeat at meetings. It’s not enough for you as the CEO to show up to meetings and talk about core values or use buzz words. It’s more than that. Leaders need to live the behaviors consistently and the values need to be talked about all the time, beginning with the highest-ranking leaders. If ‘culture’ seems like a string of buzzwords, ultimately no one will care. On the other hand, if your culture is built on a legitimate set of values that guides daily action; eventually everyone will buy-in. It may surprise you, but I believe it’s better to have weaker talent and less experience on your team but have a thriving culture, than it is to have amazing talent and experience, but no culture. Onboarding processes are driven by evangelists of the company culture, as opposed to transactional processes driven by HR or another department; this means that someone’s first few days/weeks in the company are focused on purpose and vision, as opposed to filling out forms and getting office supplies. It’s shifting transactional to transformative. Facilitating discussions around culture definition and scaling is something we’re involved in a lot with our clients and we’re often tasked with acting as a kind of ‘ombudsman’ for some companies — we’re the ones employees go to if senior leaders violate the cultural norms they’re preaching. It can be an interesting spot to be in for us, but having a neutral third-party helps ensure that two-way, transparent dialogues are created about the mission and purpose of the organization. Oftentimes founders and core employees can be very set in their perceptions about the company, its values, and where it’s headed. Having a facilitator who isn’t tied to the politics or outcomes can observe, guide discussions, and help you foster an authentic culture for your organization. 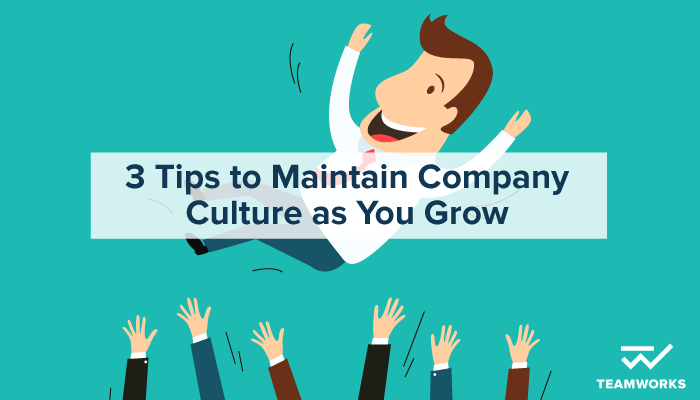 Use these tips to ensure the culture you’re creating within your organization will continue to grow and prosper, along with your bottom line. At TeamWorks we’re dedicated to helping leaders create On-Purpose organizations. Backed by 25 years of experience, when you introduce a TeamWorks program to your organization, you will experience powerful and effective change, at all levels. Sign up to get access to a monthly digest of our most popular articles, industry research and of course purposeful leadership strategies. Delivered right to your inbox. © 2016 TeamWorks. Illustrations by Ben Weeks. Brand & Web Design by YCREATIVE. Max Carbone passionately believes in the power of positive change. He sees the strategic exploration of change as an emancipating first step towards over-achievement, both on a personal and corporate level. Embracing change and always looking forward is the first step towards developing an On Purpose mindset, the foundation of which is the core belief of TeamWorks – his one true business passion. A voracious learner, Max has gleaned important insights from some of the greatest leaders of our time in business, sports and psychology. Max founded Team Works on the Five Fundamentals of Business Strategy: CEO Purpose, Market Intelligence, Team Strategic Planning, Team Architecture and Team Unity. Through his consulting and insights work, Max helps leaders and teams successfully achieve positive and measurable change. TeamWorks is his conduit towards helping organizations overcome their challenges, turnaround their company performance and significantly improve results. Max has an MBA from the Schulich School of Business (York University). Max is also the author of a book on leadership entitled “Scoring Eagles" and is a certified golf and ski instructor. Anna Carbone is a successful marketing and business development leader with a proven track record in launching brands and driving growth for some of Canada’s most innovative media companies. She has held several senior sales leadership positions including CHUM Specialty Television, CTV and Blue Ant Media, where she built and managed high-performing sales teams. Anna’s Purpose: To help organizations uncover their entrepreneurial spark. Anna’s Approach: To develop creative business strategies from market insights that will keep teams informed, On Purpose and passionate about driving future growth. Kelly Dalby is an energetic management professional who has helped build and manage several highly successful On Purpose teams. Through her focus on business process improvement and change management, Kelly has lead a variety of multidisciplinary teams to identify and align goals, achieve results and long term satisfaction. Kelly's unique perspective comes from her experience in working with companies such as Chrysler LLC, Manulife, Scotiabank and OnX Enterprise Solutions, as well as numerous other mid-size organizations and entrepreneurial start-ups. Kelly’s purpose: To help organizations clarify and achieve their purpose through actions. Kelly’s approach: To develop and coordinate strategic plans, using proven methods that focus on communication and aligned accountability. Nicky Billou helps people become champions through what he calls Finish Line Thinking™. Nicky’s pioneering techniques have seen him work with Olympic gold medalists Donovan Bailey & Mark McKoy, while helping Theresa Dugwell set three ultra-distance athletic Guinness World Records. Nicky collaborates with TeamWorks as a trusted adviser to leaders and teams dedicated to improving their On Purpose thinking for greater business health. Nicky’s Purpose: To help entrepreneurs believe in their dreams and make their dreams come true. Nicky’s Approach: To teach entrepreneurs and their teams how to have the mindset of a champion and how to 10x their best connections so that they can grow their business dramatically. As a trusted advisor to CEOs and senior leaders, Colleen is highly experienced in facilitating leadership teams to define, plan and implement their On Purpose mindset. She is an industry-certified six-sigma black belt, certified Project Management Professional (PMP) and graduate of Queen’s University in Applied Science (Chemical Engineering). Colleen's Purpose: To help leaders develop the capabilities in themselves and their organization that delivers outstanding results. Do you feel your team is capable of offering you more? More passion… more enthusiasm… more moxie? Teams that suffer from a lack of an On Purpose vision will “go through the motions”, clocking in and performing their basic tasks to completion but lack that fundamental drive and enthusiasm your organization needs to catapult you to the next level. Our On-Strategy program is a highly effective leadership and team performance system designed to re-ignite your company’s approach to business planning and execution. Your team will learn how to improve performance through facilitated team interactions designed according to the TeamWorks On Purpose model. Your organization will develop clear paths of accountability, as well as identifying team and individual strengths, and utilizing those strengths for a purpose-driven organization. Sometimes, organizations get stuck in a rhythm. We’ve seen businesses that are functioning well and turning an OK profit, but missing market opportunities, losing key personnel and losing a shine on their overall brand. Shake up that routine – and schedule a session with TeamWorks! Our On-Market program is proven to help your organization analyze the market, evaluate your team and develop a strategic On Purpose Plan that maximizes results. The leaders we work with have found this program to be a highly effective system for stepping up performance through leveraging insights from customer research. If you’re a leader, you’ve been On Purpose and driven to get where you are. It takes focus, creativity and passion to get to the top. But, to stay at the top and continue performing to your max, you need more. We’re here to give you more in spades, and the knowhow to continue performing at new, higher levels. The On-Purpose program is a liberating C-Level leadership system focused on delivering an achievable, passionate strategic vision. It builds an organizational culture and team structure that leads to greater core responsibility and greater company profitability. Greg works with organizations to create On Purpose cultures and high-performance teams by focusing on what makes them uniquely remarkable. Effectively building their organization from the inside out, Greg coaches leaders to drive everything they say and do through this lens of compelling clarity. Greg offers TeamWorks clients an exceptional range of talent including; high-level creativity, brand strategy and a relentless dedication to purpose, passion, clarity and consistency. Greg has worked with clients including: Bombardier Commercial Aircraft, Canadian Tire, Workopolis, Fiera Properties, KingSett Capital, Accora Village, Cherishome Living, Quadrangle Architects, AtlasCare, IAMGOLD, Kinross Gold and QUEUE IT Professionals. Greg's Purpose: To create more joy in the world by instilling a deeper sense of purpose and passion in people and organizations. Greg's Approach: To discover clients authentically, uncovering their purpose, promise and unique value proposition. An inspired, positive and powerful leader/CEO is the ultimate foundation of a successful organization. Through individual and group sessions, TeamWorks helps team members identify their source of inspiration and develop a common purpose that aligns team spirit. The result is a powerful organizational purpose that energizes and engages teams. Learn the truth about what your market thinks of you instead of running on conjecture. Through the development and execution of a professional market survey, TeamWorks uncovers competitive insights and YOUR customers, lapsed customers and prospects wants and needs. The result is quantifiable market insights to help build a winning strategic plan. Experience a hands-on interactive planning session that engages the leader and team in developing a cohesive, team game plan. Gain insight into how your team is built, and how to re-organize or rebuild it for success. By evaluating the collective team profile and fit with strategy, TeamWorks assesses your team member’s suitability for their role & responsibilities. The result is an appropriate compliment of team members to ensure organizational success. Develop a disciplined, engaged and performing team that responds to the leader and has accountability for overall business goals. Through the implementation of regular quarterly meetings, TeamWorks helps increase individual and collective execution of agreed upon actions. The result is a leader and team that stay On Purpose and execute on the overall business vision.